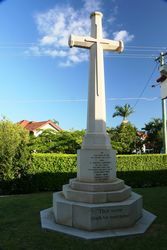 The Cross of Sacrifice was erected to commemorate those who died in service or were killed in action in World War One and especially those from the parish. It was originally located on the Sandgate Road side of the Church, however the memorial was relocated to the current position in 2003. 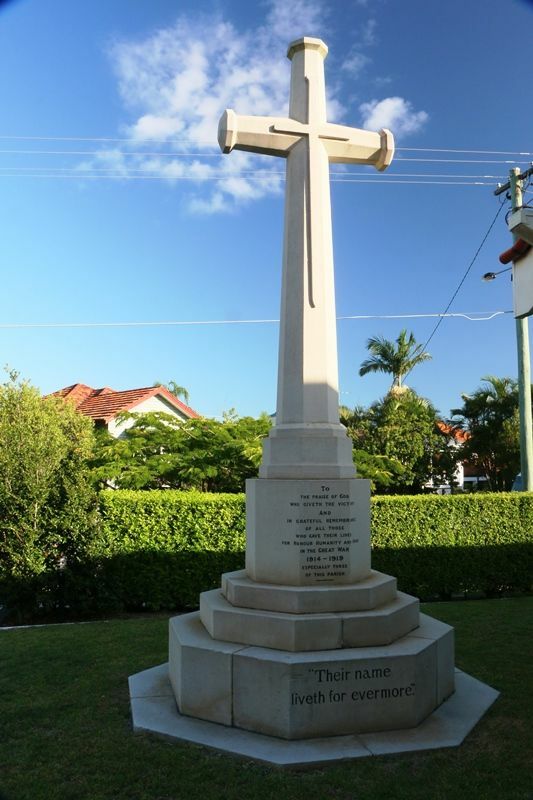 "The Cross of Sacrifice," which has been erected in the church grounds of St. Colomb's Clayfield will be dedicated by Archbishop Donaldson on Sunday at 10.30am. It is a replica of the cross erected in Lambeth Palace Ggrounds, and which served as a model for those afterwards placed in the cemeteries of France. It is an imposing octagonal structure standing 18ft high built of Helidon white freestone, and having a sword embossed on the front and on the back of the shaft. No names appear on the memorial, but it is inscribed: "To the praise of God, Who giveth the victory, and in memory of all those who gave their lives for honour, humanity, and home, in the Great War, 1914-1919, especially those of this parish. Their name liveth for evermore." The dedication of three memorial windows and a font will follow immediately after the cross is unveiled, and the usual service will then begin. Daily Mail (Brisbane), 21 October 1921.